← Starting at the beginning: What is Trauma? As therapists working with children who have experienced different degrees of trauma, we do see encouraging evidence of significant improvement in the children’s lives due to the weekly therapy sessions and the parental intervention that we provide. We have seen the necessary inclusion of parenting lessons, group therapy, art therapy and individual therapy for parents who have children who have experienced trauma. I am however not only continually faced with parents who are struggling but also teachers who are desperately asking for advice about the behaviour of the children in their large classes. We all know for a child to flourish they need to feel safe all the time. As the parent increases in knowledge, skill and understanding of the needs of the child and as they grow in awareness of how their own issues can adversely affect the child’s healthy development, the children can feel safer at home. This is why we spend time working with the parents too. However, despite the evidenced success of our service, we feel that we cant help but want to be part of the solution to the growing number of children who are finding school too difficult due to their trauma. Every child spends an average of 6 hours per day in schools. We know that teachers aim for each child to feel safe and enjoy learning, but it is becoming increasingly apparent that teachers can feel unable to consistently facilitate an emotionally safe environment at schools that serve hundreds of pupils from a range of backgrounds, situations and contexts. We believe in the provision of schools that focus on emotional safety for children who have experienced trauma. An average child who has experienced trauma without a strong, consistent, attentive family unit to enable them to process these events, will have to develop some degree of coping mechanisms and will probably be in either a state of anxiety, hypervigilance or will manage their survival in a variety of creative ways due to the flight, fright or freeze survival instinct. Now lets put these trauma reactions and strong survival feelings into a class with 30 other children all in different contexts themselves and add a teacher who has no training in psychology or trauma who is paid to see evidenced academic outcomes that either affirm his/her skills or cause them to feel a further pressure or failure. Teachers are under increasing pressure to produce good academic results as if children were all empty boxes that need filling with information. Empathetic teachers are often emotionally exhausted when/if they try and deal with children as individuals with unique complex needs. Yet children who are in trauma will be less likely to be able to fully engage in learning. The brain of the child who is traumatised is chronically engaged in survival mode. Because of this preoccupation with managing risk, the child’s brain’s capacity and opportunities to develop the brains neural networks and systems involved in learning are severely compromised. This makes it hard for the teacher and the student. We are starting a therapeutic education centre for children who need to feel safe in order to learn. 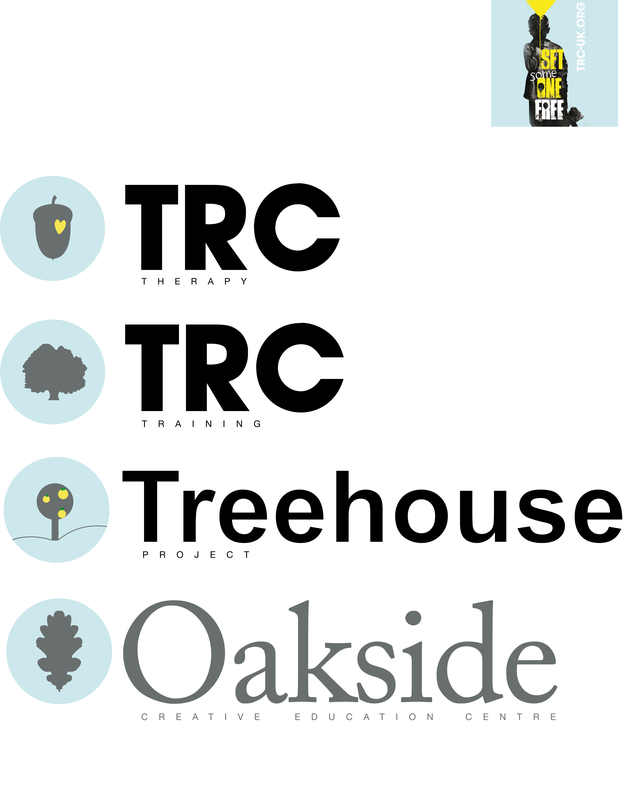 Oakside Creative Education Centre, a new project from the TRC will be a provision for children who need a therapeutic school environment. We will be using multi sensory teaching based in the woods and in an art studio. As a teacher, this is very helpful to read. So good to hear of Oakside Creative starting up to help children who need a theraputic environment- this is so needed! I’m sure this is going to help so many young people learn and flourish. Excellent. We’re doing creative arts work with kids at-risk & living in challenging environments in Limerick, Ireland since 2002. Creative arts are such a powerful tool. All the best to you in your endeavor. If you would like to make contact, please do. Bernadette for Blue Box Creative Learning Centre. Twitter: blue_box_clc. Amazing news- cant wait to hear the inevitable positive news of lives being transformed further by Oakside. As a trainee dramatherapist who is researching into supporting teachers in schools to support, connect and empower children who have gone through trauma, I think your school sounds brilliant! What an amazing vision to be apart of. I look forward to hearing stories of lives changes for the better.